Uploaded or synced images from the virtual images section are added to nodes, a node or multiple nodes are added to layouts, and layouts are added to Instance Types. Scripts and File Templates can be attached to nodes, with phased execution options for scripts. Adding an Instance Type creates a new Library Item category. Multiple layouts can be added to an instance type, and these layout can have different nodes attached. The instance wizard will present the layout options compatible with the selected cloud. If cloud selection is turned off, all layouts will be presented for all cloud types accessible by the user. Useful shortcode for provisioning naming schemes and export reference. Upon saving, this Instance Type will be available in the Provisioning Catalog, per user role access. However we still need to add layouts to the Instance Type, and prior to creating a layout, we will add a node type. Custom Instance Types do not display logs on the instance page. Logs will only show on the VM page. The Options fields will change depending on the Technology option selected. For VM provisioning technology options, select an image from the VM Image dropdown, which is populated from the Virtual Images Section and will include images uploaded into Morpheus, and synced images from added clouds. Amazon and Azure Marketplace Images can be added in the Virtual Images section for use as node types in custom library items. For Docker, type in the name and version of the Docker Image and select the integrated registry. To open port on the node, select “Add Port” and enter the name and port to expose. 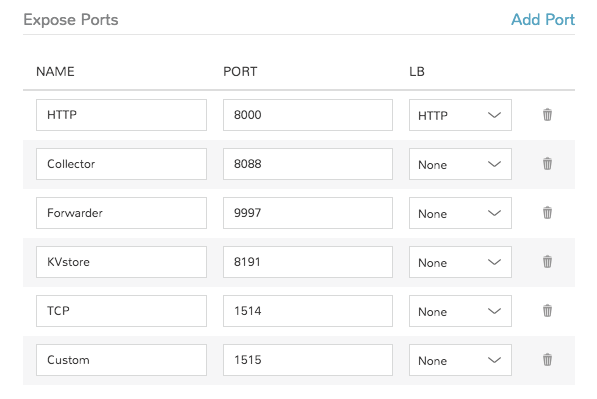 The Load Balancer http, https or tcp setting is only required when attaching to load balancers. To attach scripts and templates that have been added to the Library to a node type, start typing the name and then select the script(s) and/or template(s). The Execution Phase can be set for scripts in the Scripts section. Search will populate Scripts or Templates containing the characters entered anywhere in their name, not just the first letter(s) of the name. Upon save the Node Type will be created, and available for adding to layouts. Layouts are added to Instance types, and will be presented under the Configuration Options dropdown in the Provisioning Wizard for that Instance type. 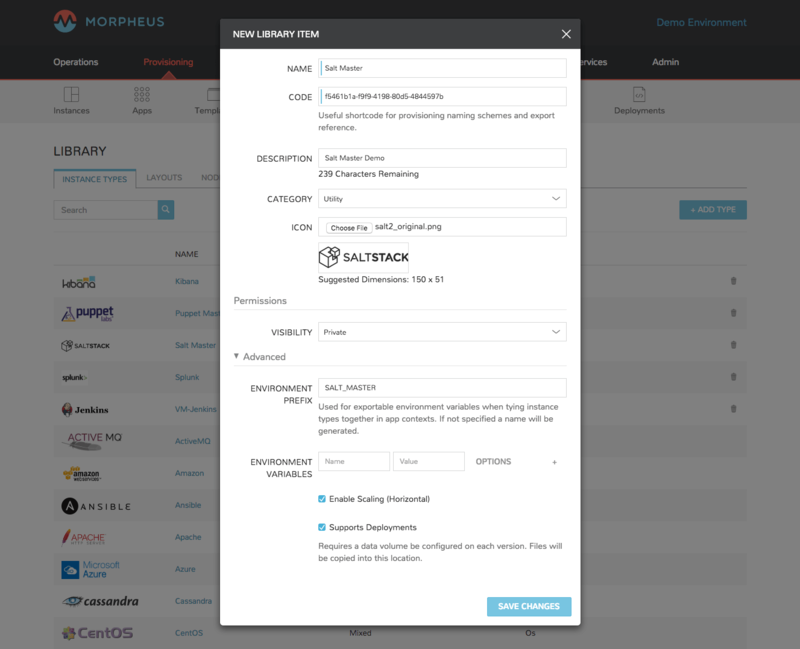 Select the Instance Type to add the new Layout to. Custom Instance Types must already be created and one layout cannot be added to multiple instance types, or change Instance Types after creation. Layouts cannot be added to Morpheus provided library items at this time. The version number or name for the Layout. Layouts in an Instance Type with the same version will all show under the Configuration Options dropdown when that version in selected while provisioning. Technology determines which cloud this layout will be available for. Custom evars to be added to the instance when provisioned. Upon save, the layout will be attached to the selected Instance Type, and available when provisioning that Instance Type for the appropriate cloud technology. Option Types allow you to create additional fields within the provisioning wizard. These field entries can then be used in scripts and templates using our variable naming convention (more here). Much like Option Types, Option Lists allow you to give the user more choices during provisioning to then be passed to scripts and/or automation. Option Lists, however, are pre-defined insofar as they are not free-form. They can either be manually entered CSV or JSON or they can be dynamically compiled from REST calls via GET or POST requests. Your new Library Item is now ready for provisioning. Multiple Layouts, Versions and Technology types can be added to a single Instance Type.